If any of you are into collecting watches, you know that watch prices can run from a few dollars for a drugstore watch that serves merely as a timekeeper to hundreds of thousands for jewel and precious metal combinations valued for their craftsmanship and aesthetic appeal. While purchasing and collecting watches is a hobby for many people, the gifting of a watch has come to hold a great deal of symbolism depending upon the occasion and the relationship between the giver and receiver. Clearly the implication is that the symbolic time has come for the father to gift his watch to his son. This advertisement is heavy with metaphor; the passing of the torch, the wisdom of the patriarch and his values, the family history and story. 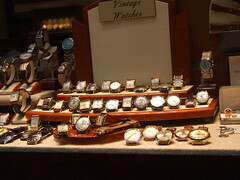 “A Patek Philippe watch is not merely a method of telling the time. It is a silent statement about your values. Each Patek Philippe is made to become a story, a tale of emotions. Who gave you the watch. On what milestone in your life. With what words. To whom did you pass on your watch. A labor of love received and given with love. All of our watches have the ability to create an emotional response in their own right. This emotion is not just at the heart of every watch – it is at the heart of our company. I am struck by the sentiment and how much power we’ve imbued the gifting of a watch to both the giver and receiver. And I am also moved by the concept of how we are really only custodians of everything that comes through our lives, from watches to our stories for future generations. I don’t own my house or my antique furniture or my books or even my photos. I am their care-taker and it’s my responsibility to not only preserve them but to pass on their significance to future custodians. It is the collection of these things and events that make up each of our “life stories”.